Suggestion for a potential new "biome"
This thread was marked as Locked by citricsquid. "Your overuse of quotation marks and -___-'s disturbs me. Why would you do that?" "On topic, this suggestion just doesn't bring much to the table. An unfitting freeze mechanic and a gigantic mass that is plainly visible, and is basically unhittable. This simply doesn't fit. Like, what is the point?" How is a "freezing mechanic" in the waters next to an iceberg "unfitting"
It doesn't fit in minecraft, it does fit involving an iceberg but if it was in minecraft it wouldn't fit. "It doesn't fit in minecraft, it does fit involving an iceberg but if it was in minecraft it wouldn't fit." they would have to have warm and cold climates for it to make sense, but an iceberg/artic biome would be cool. They could add penguins and seals, and igloo villages (that is with eskimos) just a thought. For icebergs to be a challenge, they would have to be either REALLY close, or Sir, we're gonna need a bigger boat. There is one God. The creator of the heavens and the earth, who sent his son down to earth to save us... he loves you and he's pursuing you. Return to him. Bartin, a speeding boat would see this iceberg of yours a mile away, posing little to no danger to boats -__- Minecraft is not real life; real life boats are rarely as small as a Minecraft boat and thus have more momentum, which makes icebergs dangerous. 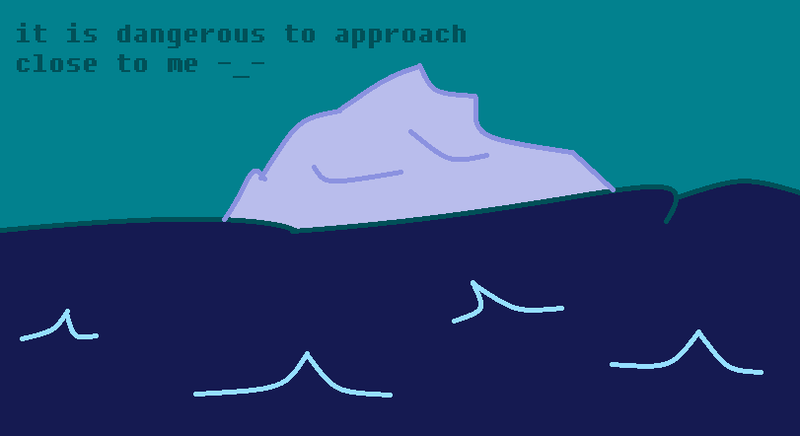 Furthermore -__- icebergs are not a biome. They could perhaps conceivably be generated structures, though I'm not sure how this will put the fear of God into travellers, given the relatively petty nature of Minecraft 'travel' and lack of any real danger -__- Having the water deal damage would be a big nuisance to everyone -__- heck you can be surrounded by flames and not die, why can't you be in somewhat cold water? Also, could you stop saying 'epic' and using '-__-' faces everywhere? It's really distraction and in no way constitutes your 'personal lore'. Don't get me wrong, I understand the true intention behind this thread, but I really want to see where this goes. The example you provided doesn't work in all cases. What about a McDonalds franchise? That isn't in the game, does that mean the idea still has potential? Well, let's see this lore. Unfortunately, saying this does not fix the problem. At all. It still bugs me. And a water freezing mechanic next to icebergs is unfitting simply because there's no climate in Minecraft. Sure, in some biomes you find snow, but the cold simply doesn't hurt you. Even taking a swim right next to an ice sheet doesn't have any harmful effects, so why would this? Hello ... Bartin here -__- I'm just going to cut these things out and fix grammar as I go, as to not be driven insane. I'll leave this face in so this message won't be sporadic. with another epic Minecraft "idea" Oh, we'll see. We'll see. Through my travels across Minecraft it has become apparent that our oceans are bare, that is to say I have to agree with you on this one. there is no danger, nothing to fear ... to brave the world's oceans once called for the strongest and most fearless of men ... but in minecraft it calls for a "crafting table" and 5 logs Well, technically 2 logs, for 5 planks. ... truly, something must be done. That is why I'm here. I know how to fix this - trust me. We must introduce a great danger to Minecraft's oceans ... that is the only way for this to be solved: a great danger must inhabit the world of Minecraft's oceans ... and this is where the "idea" gets epic ... are you ready? Prepare yourself: Icebergs. This new "biome" will of course generate in the ocean and pose a great danger to travelling sea vessels as crashing into one will sink your boat (and yourself) into the freezing waters below. Except that you could just dodge them. But the boat sinking would be a nice feature. The water is so cold, infact, that it deals damage to people submerged in it... the rate at which damage occurs could possibly be at the rate of starvation That's half a heart per four seconds. Seems okay, but maybe half a heart per 3 seconds would be better. (or slower) I am not sure yet, the specifics of which can be left to Mojang's specifics. Also -__- following Mojang's recent trend of pre-generated structures it would be epic if there was possibly a "sunken ship" generated on the seafloor around the iceberg ... this could also be a potential spawning zone for the "Guardian" mob This might work, but what would it test for in order to spawn one? Deep ocean? Normal ocean? "Iceberg?" ... adding to the dangers around the iceberg. This is truly an epic biome and will put the "fear of god" back into the hearts of adventurers Only if they find one. So, no new blocks? No polar bears spawning on the glaciers? Months before polar bears is a good point. No loot inside a sunken ship? No look for pirate ships? At least give us a block palette for the ships. The glacier, sadly just seems like it would be a good "island" to build a base on, or as a possible place for a mini Guardian farm. Either way, it's still much better than your last suggestion. (No offense.) Partial support. Watch out for the crabocalypse. Some say the day will never come. But it will. If you'd like to talk with me about other games, here are a few I play. Come to think of it, I mainly play fighting-based games. What about a McDonalds franchise? That isn't in the game, does that mean the idea still has potential? "Well, let's see this lore." Perhaps I can sell this hypothetical to you... the water temperature required for ice formations such as the iceberg to form is far colder than the water in the "frozen oceans" you describe ... there are many other perspectives i can take as well -__-... do you truly lack the creative vision that you would make me go through every single hypothetical concept for this suggestion? So, no new blocks? No polar bears spawning on the glaciers? No loot inside a sunken ship? So basically an ice spikes in water that can kill you if you dive into it? No Support since it's basically a mountainous ice ocean. Obviously not as there are inherent qualities to a "mcdonalds franchise" that make it unfitting (im not going to spoonfeed -__- you should be able to tell what these are) Well, if you're not going to be bothered, than why should I? There's no reason for this iceberg to exist. You'll have to join my epic clan, "Trade Dynamics Bartin" (TDB) to get the full package, but I will leave you with this treat, take it with you - it would be unwise not to... imagine a monk, deep in thought, staring at the ground ... and as such, that is how the -__- face exists in my lore So... It's there for no reason, then. I'm sure you can meditate or whatever without splashing annoying emoticons all over your text. Biomes do have a "temperature" variable -__- just because environmental damage doesn't exist in current versions of the game doesn't say anything about it being "unfitting" for future versions -__- ... as I said before, a similar argument can be made against "starvation" damage Well, I actually have nothing to say to that. Except, hunger did add something at least (stackable food). This suggestion brings nothing but annoyance and an easily avoidable risk. Plus, that temperature variable literally just determines whether the biome gets rain, snow, or neither. Perhaps I can sell this hypothetical to you... the water temperature required for ice formations such as the iceberg to form is far colder than the water in the "frozen oceans" you describe ... there are many other perspectives i can take as well -__-... do you truly lack the creative vision that you would make me go through every single hypothetical concept for this suggestion? So now you're insulting my creative vision, eh? Well, I'm not interested in a fight, so I'll pretend you never said that. Sure, the temperature required to form icebergs is cold... But that's just their formation. That iceberg has been drifting through much warmer oceans for god knows how long. Thus, the water around it has to be above freezing. After all, it's not frozen. Like I said, temperature damage isn't a thing in Minecraft unless you're quite literally on fire. The only way cold would damage you, by Minecraft standards, would be if you literally froze solid. A "nuisance to everyone" holy cow did you really think such a trite argument like this would be effective here -__-? It's hardly a nuisance if it can be avoided by staying out of the dangerously cold water... sheesh... also, you can be surrounded by flames and not die because you are not in the flames -__-, if you are in fire then you take damage in much the same way as you would take damage if you're in the freezing water... this should be obvious -__- Wow... Good job. You just basically said your suggestion is useless. Because it can be easily avoided, the "challenge" that this is supposed to represent is nonexistent. Even if your boat breaks, you can just pop another one out of your back pocket, because this is Minecraft. This isn't fun. This is annoying. Since you've claimed bold text already, my responses are in lovely and delicate italics. I remain thoroughly unconvinced. This suggestion brings nothing but annoyance and an easily avoidable risk. How is something that is an "easily avoidable risk" an "annoyance" -__- seems you didn't think that one through... playing to your logic; avoiding starvation damage is "easily avoidable" but the damage I take if I don't eat is an "annoyance" -__- Stop comparing this suggestion to hunger. It's pointless. Hunger is a mechanic that actually requires thought. It's a challenge; Build farms to get food. Then, you can simply carry it and eat it as needed. Easy. Like I said, temperature damage isn't a thing in Minecraft unless you're quite literally on fire. The only way cold would damage you, by Minecraft standards, would be if you literally froze solid. "Hunger damage" aka starvation wasn't a thing in Minecraft either, until they put it in... checkmate -__- Look, I'm not arguing if you're just going to use the same point over and over. Hunger was added to make food better and more useful. This is just one specialized thing that you never need to even see. It takes seconds to turn away from it. Even if your boat breaks, you can just pop another one out of your back pocket, because this is Minecraft. This isn't fun. This is annoying. You knew what you signed up for when you entered the icy waters... with the epic loot rewards that come with the iceberg, come high environmental dangers -__- Look... That wasn't the point I was trying to make. The point is that this suggestion adds no actual danger. It only adds annoyance. I'm starting to near the end of my rope here. I... I can feel myself getting more and more angry at you. Please don't make me yell at you. The only thing holding me back is moderator action and my own reputation. The point of this discussion has shifted. It doesn't matter whether this suggestion is like hunger or not. Accept this. It's about whether or not this suggestion is completely pointless. This suggestion is pointless. If you can refute this point, you're welcome to, but otherwise, this discussion is over. "Stop comparing this suggestion to hunger. It's pointless." "I don't think the problem is with my writing but instead with the inhibited minds of the people reading my thread"
"Hunger was added to make food better and more useful." Icy waters do not exist in the current version of Minecraft, therefore your suggestion cannot make boats more useful in icy waters as there is no prior standard of boats' usefulness in icy waters to compare with. It can add icy waters, which boats are useful in, but it cannot make boats more useful in icy water. "It takes seconds to turn away from it." Because good mechanics are interesting rather than annoying. "Look... That wasn't the point I was trying to make. The point is that this suggestion adds no actual danger. It only adds annoyance." While more experienced players do find certain mechanics less challenging than less experienced players, this mechanic would not be one of them. It is equally annoying for experienced and inexperienced players as prevention is simple. Any player who can craft a boat and right-click to mount it can avoid icy water. "This suggestion is pointless. If you can refute this point, you're welcome to, but otherwise, this discussion is over"
"If you are, you surely know that a debater does not insult their opponent. However you have done this on numerous occasions"
"Icy waters do not exist in the current version of Minecraft, therefore your suggestion cannot make boats more useful in icy waters as there is no prior standard of boats' usefulness in icy waters to compare with. It can add icy waters, which boats are useful in, but it cannot make boats more useful in icy water." "Because good mechanics are interesting rather than annoying." "It is equally annoying for experienced and inexperienced players as prevention is simple. Any player who can craft a boat and right-click to mount it can avoid icy water." Hello ... Bartin here -__- with another epic Minecraft "idea"
Through my travels across Minecraft it has become apparent that our oceans are bare, that is to say -__- there is no danger, nothing to fear ... to brave the world's oceans once called for the strongest and most fearless of men ... but in minecraft it calls for a "crafting table" and 5 logs ... truly, something must be done. That is why im here. -__- I know how to fix this - trust me. Also -__- following Mojang's recent trend of pre-generated structures it would be epic if there was possibly a "sunken ship" generated on the seafloor around the iceberg ... this could also be a potential spawning zone for the "Guardian" mob ... adding to the dangers around the iceberg. regardless -__- I am not going to repeat anything I already said, you know why my idea is epic You're not putting forth an argument either. The only reason I tried to stop was because I didn't want to flame you. I'm too dignified for that. However, I will say that I don't like debating with you because you use circular logic chains that you can always claim are right. Literally your only argument in favor of this suggestion is "it will be good". It's pointless? But it will be good! It makes no sense? But it's epic! I can't win because the game is skewed, and I don't play with cheaters. Screw this. You're not bringing up good points, you're not being intelligent, you're not even fun to debate with because your logic is so flawed. No support. End of discussion. ^^^ I'm sorry for adding more to this horrible discussion since you said end of discussion. I just wanted to point out that there is a fine line between nuisance and challenge that Bartin is failing to see. This is not fun at all and there is no benefit of breaking 15 boats in one biome. An example of a challenge is the Ender Dragon which is a challenge since the dragon herself is sneaky and the Ender Dragon fight has benefits, such as dragon's breath. Also, this is forcefully put upon you, while the Dragon fight is optional. Plus, you can go around this biome, rendering it pointless.